Even slight movements of the face, mouth and fingers can yield insights into the brain that controls them. The ability to precisely measure the muscle forces driving those movements could improve diagnosis and treatment of nervous system maladies ranging from stroke and traumatic brain injuries to Parkinson’s disease and autism. 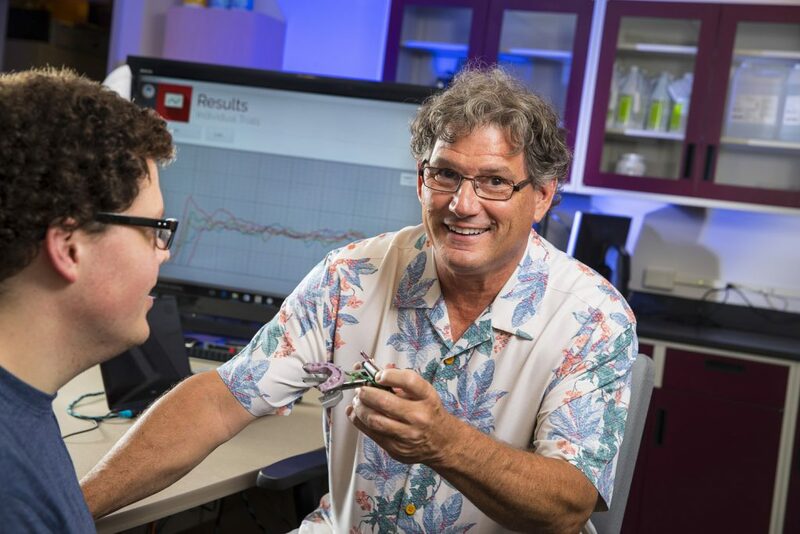 Steven Barlow, associate director of UNL’s Center for Brain, Biology and Behavior and the Corwin Moore Professor of Special Education and Communication Disorders, teamed with students in the Jeffrey S. Raikes School of Computer Science and Management to refine a novel system that does just that. Known as ForceWIN10, the technology features custom software and pressure sensors that collectively cost only a few hundred dollars. In a matter of minutes, the system wirelessly measures and records how much force is generated – and how well that force is controlled – by muscle groups essential to the fine motor control required for daily tasks such as eating, speaking and typing. Steven Barlow shows a prototype of the ForceWIN10 system to Jake Greenwood, lab research assistant. Barlow is refining the technology through a partnership with Lincoln’s Madonna Rehabilitation Hospital, which is testing a prototype of the system. Raikes School students in mechanical and materials engineering, electrical and computer engineering, and computer science have helped construct multiple prototypes and program updates to the system’s software. Barlow began collaborating with the Raikes School at the recommendation of NUtech Ventures, UNL’s technology commercialization affiliate, which is helping Barlow patent the system.